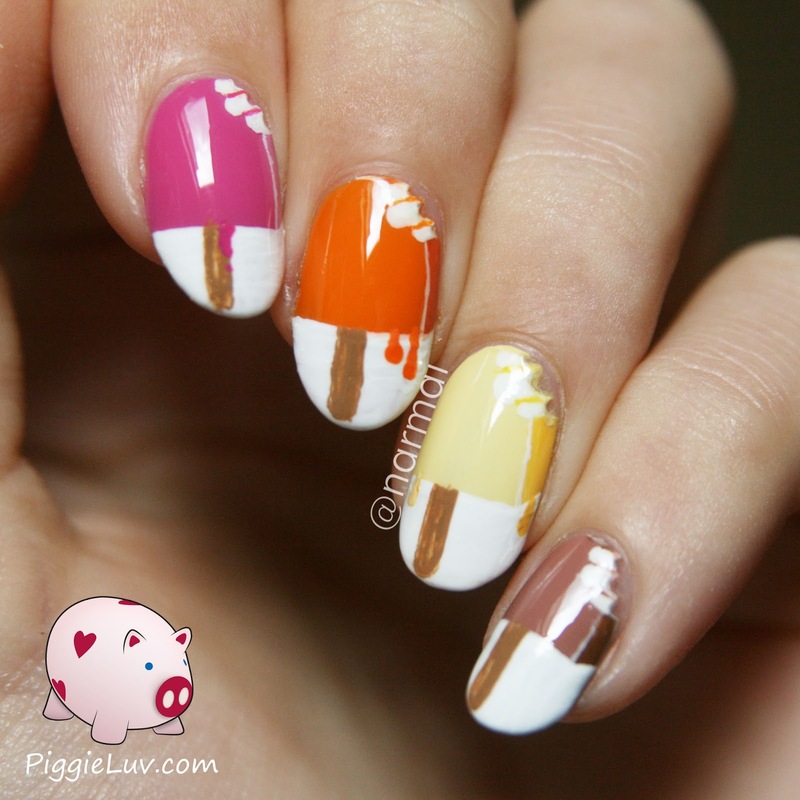 PiggieLuv: Magnum ice cream nail art with video tutorial! Heyyyy ladies! 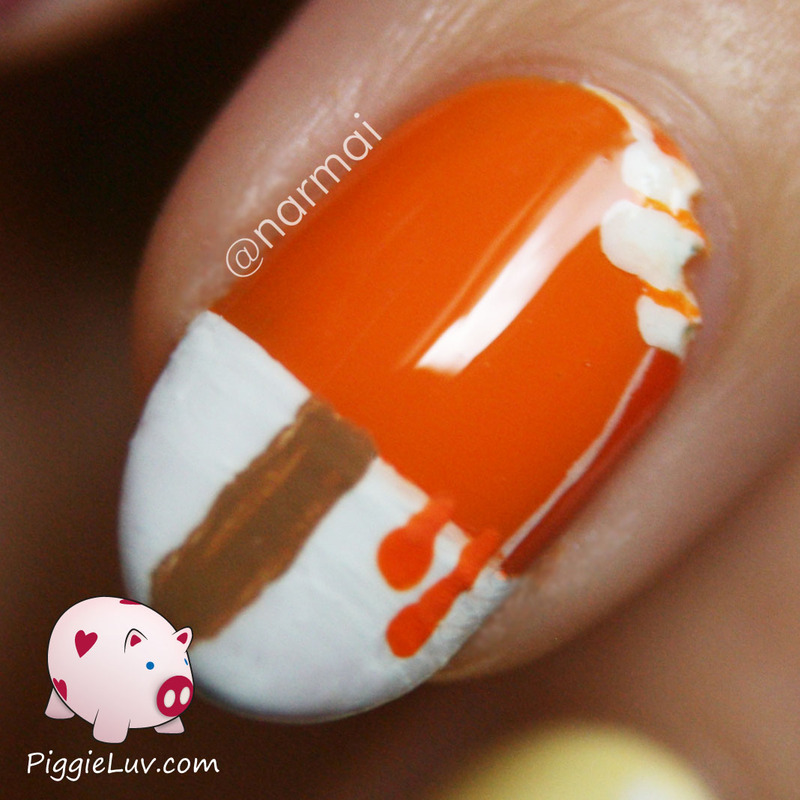 It's been 2 years since I made ice cream nail art so it was about time! I've been forming this idea in my head for weeks and suddenly it was crystal clear and I started making it. Don't they look EXACTLY like Magnums?! Click to see more! They actually do look really yummy! Ofcourse the sticks aren't practical at all, so scroll down for a tamer version of these, plus a video tutorial. For the base colors of these scrumptious nails, I used Tip Top Nails Sherbet Angel, Picture Polish Citrus, Only You Banana Split and OPI Barefoot In Barcelona. So we have a strawberry, orange, white chocolate and creamy chocolate Magnums! I used simple cocktail picks for the sticks, I cut them and attached them by putting a drop of top coat on the other side of my nails. They were actually glued on really well! Et voilá, the don't-poke-your-eyes-out version! They're not as much fun as the other ones, in my personal crazy opinion, but at least they're safer and fit for everyday wear. And still really summery! I painted the design using white, pink, orange, yellow and brown acrylic paint, and I used my Pure Color Glamour #1 detail brush to do it. I actually chose to do the wooden sticks not very neatly, to get kind of a wood look. In the video tutorial, you can see that I remove the 'bites' with a dotting tool, I got this one from the lovely Claire at Christrio Scotland! I hope the tutorial is pretty self explanatory, if anything is unclear please feel free to ask! Thanks so much for watching, my dears!!! I received Tip Top Nails Sherbet Angel as a press sample for an honest review. Opinions expressed are 100% my own and not influenced in any way other than the quality of the product itself.